After yet another loss by KO/TKO, Maynard may need to start thinking about retirement. Every fighter deserves the dignity of charting their own career course. What they do is taxing, both physically and mentally. It is grueling and challenging in so many ways, from financing a training camp to working through injuries to facing the harsh glare of the spotlight. It’s that last part that can be the most difficult for some, because the light can be blinding and distracting, especially when it’s unwanted. 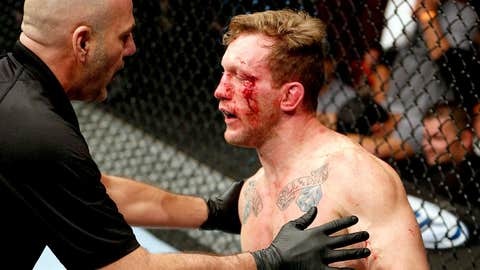 Gray Maynard is facing one of those situations now, after losing to Nate Diaz in the main event of Saturday night’s The Ultimate Fighter 18 Finale. It wasn’t just that Maynard lost, but how. For the third time in his last four fights, Maynard was knocked out rather violently. This time it was at the hands of Nate Diaz. Last May, it was via T.J. Grant. Before that it was a comeback for the ages written by Frankie Edgar. The common thread between those three opponents is that none of them have historically been considered very big punchers. After his latest knockout, Diaz has four in 26 career fights. Grant also has four in 26 career fights. And Edgar has four in 21 career fights. Yet, they all hurt and finished Maynard on strikes. And so where does that leave Maynard? Maybe it should leave him in a place he doesn’t want to be, in a room thinking about his long-term health, and whether continuing his current career is the best option. It’s not as if he’s incredibly young and has most of his future in front of him. He’s 34 years old, and he already fought for the title twice. After his current skid, he would have a long and hard road back there one more time. Not impossible, but leaning towards improbable. The three knockout losses aren’t the only troubling trend for Maynard. It’s been fairly consistent that in his recent career, he’s been out-struck during the course of his fights. According to FightMetric, while he’s landed 2.1 strikes per minute in his UFC career, he’s been hit 2.35 times per minute. That -0.26 strike differential is fairly rare for a top-level fighter, and not surprisingly, it seems to have caught up with Maynard over time. Against Diaz, he was out-landed 34-6. Against Grant it was 29-13. And in two fights against Edgar it was 161-145. Go back in time and he was out-landed by Nate Diaz the second time around and Roger Huerta and Dennis Siver, and you have to believe that all of that has added up and negatively affected his ability to take a punch. Remember, there was a time when Maynard was considered to have an excellent chin. In fact, in his first 10 UFC fights, he was never knocked down a single time, unless you count the time he slammed Rob Emerson so hard he knocked himself silly. But in standing strikes against opponents, he’d taken hundreds and never been put down. That’s all changed now, and in a hurry after being victimized in three of four. As research on brain impact and concussions continues to evolve our understanding of the gray matter, we must delve into these uncomfortable conversations about when enough is enough. Even if you believe in libertarian ideas as I do, it doesn’t preclude you from voicing concern about individual pursuits that can yield harm. No one should demand that Maynard retires, only that he offers an honest look at himself, his health and his job. Maynard seems to be at a career crossroads both in terms of his UFC job and his ability to fight at the highest level. The trick is to reach that conclusion and act on it before it’s staring you in the face; the trick is to ignore the voices in your head telling you that next time will be the start of something big. Again, once you begin that slide, it’s not impossible but improbable. Prior to the fight, Maynard had been ranked No. 5 in the UFC rankings. I suspect he’ll slide right out of the top 10, because even if you justify his losses as coming to stellar talent, you can’t erase or even obscure the fact that he has only one win in the last three calendar years. Earlier this week, I wrote that there was really nothing tangible at stake for the winner past personal satisfaction. Sadly, looking at it now, the impact on the loser is potentially exponentially greater.